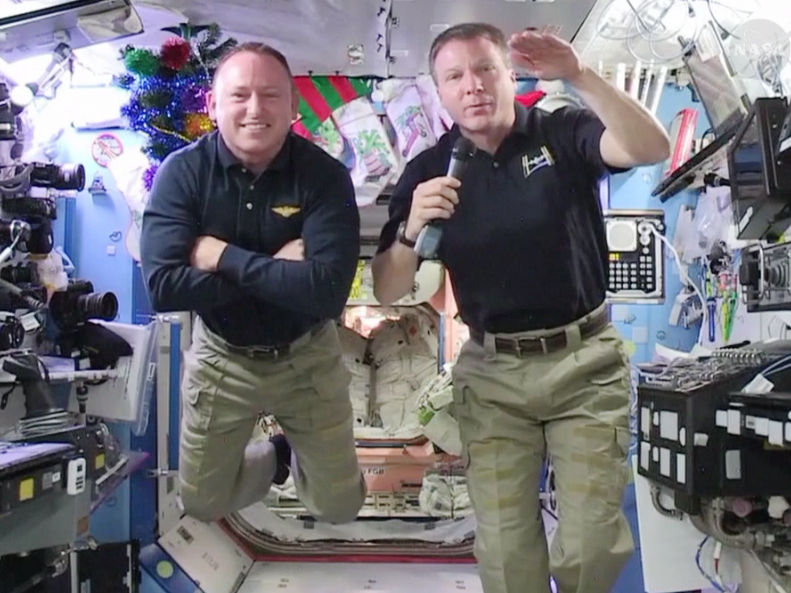 The International Space Station crew has been working on a variety of robotics activities this week. On Wednesday, they tested a humanoid robot and explored how bowling ball-sized satellites, known as SPHERES, can navigate around objects. Crew members trained earlier in the week for the planned Sunday capture of the Dragon spacecraft using the 57.7 foot Canadarm2. NASA astronaut Terry Virts unpacked Robonaut 2 so that payload controllers from the Marshall Space Flight Center in Alabama could power up its new legs for the first time. Robonaut’s legs, which arrived on a previous SpaceX mission, were installed in August. Italian astronaut Samantha Cristoforetti downloaded SPHERES data demonstrating how the small free-floating satellites build 3D maps of objects and interact and navigate using those 3D models. Cristoforetti also joined Commander Barry Wilmore removing a small satellite deployer, nicknamed CYCLOPS, from Japan’s Kibo lab module for troubleshooting. Afterward, Wilmore conducted a vision test and set up a multipurpose experiment platform in Kibo. Veteran cosmonauts Alexander Samokutyaev and Anton Shkaplerov installed more overlay sheets inside the Zarya cargo module. 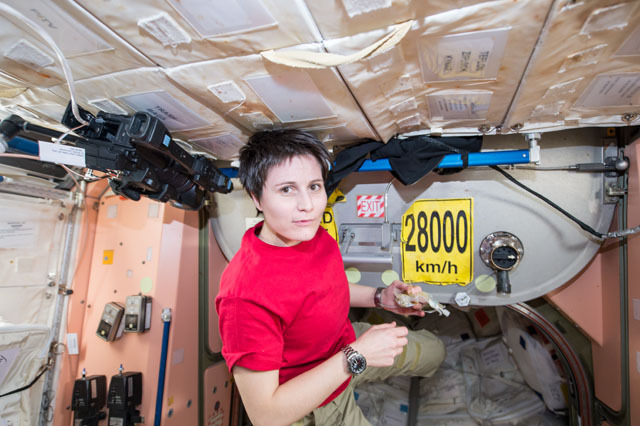 New cosmonaut Elena Serova conducted a photographic inspection of the interior panels of the Zvezda service module. The trio also worked a wide variety of science including studies of bioelectric cardiac activity and the effects that earthquakes and human activities have on Earth’s ionosphere. Commander Barry Wilmore shows off a 3D printed ratchet. 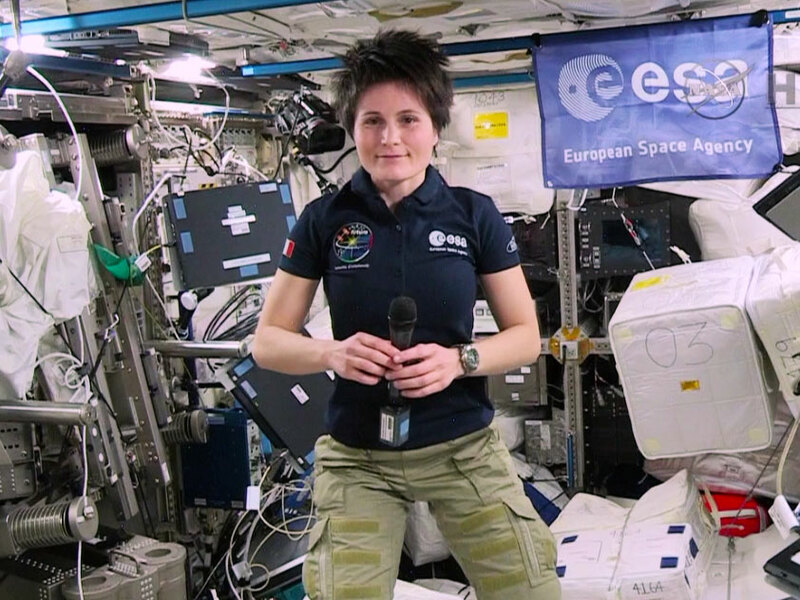 Italian astronaut Samantha Cristoforetti and cosmonaut Elena Serova started Wednesday conducting a test run of basketball-sized satellites, known as SPHERES, which float inside the International Space Station. After checking the nitrogen pressure of science freezers in the afternoon, Cristoforetti joined Commander Barry Wilmore for a robotics training session ahead of the fifth SpaceX Dragon mission scheduled for launch Friday at 1:22 p.m. EST. Wilmore began his morning with some 3D printing work before moving on to the Advanced Colloids Experiment Microscopy-3 fluids study. 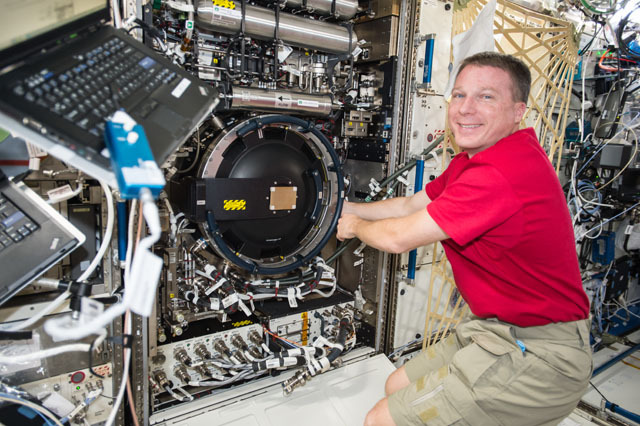 NASA astronaut Terry Virts set up the Destiny lab’s Microgravity Science Glovebox installing hardware for an experiment that will study the risk of infectious disease on long-term space missions. Cosmonauts Alexander Samokutyaev and Anton Shkaplerov were back at work inside the Zarya cargo module installing overlay sheets on interior panels. 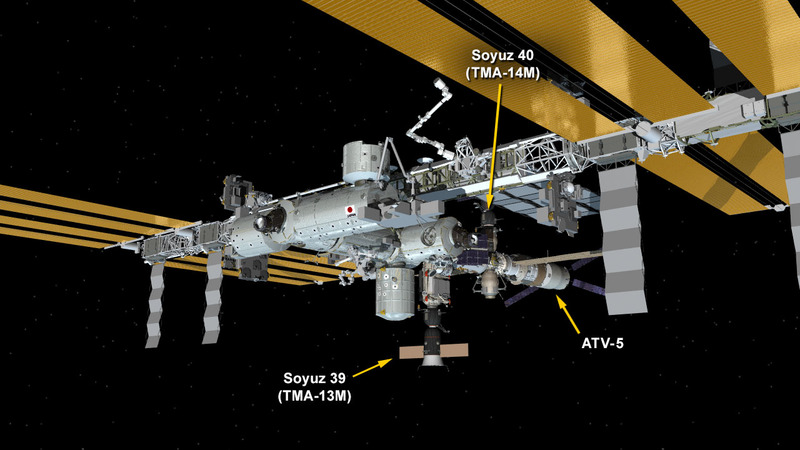 The duo split up in the afternoon for a variety of science and routine maintenance tasks in the station’s Russian segment. Three U.S. spacewalks are planned for early next year and station crew members Commander Barry Wilmore and Flight Engineer Terry Virts are preparing spacesuits and spacewalk tools. Wilmore swapped secondary oxygen packs on a pair of spacesuits, while Virts checked the torque on a pistol grip tool. After the spacesuit work, Wilmore joined Italian astronaut Samantha Cristoforetti inside the cupola for robotics training. Wilmore will operate the Canadarm2 to capture the SpaceX Dragon when it arrives Sunday morning. Samantha will assist the commander during the commercial craft’s approach and rendezvous. 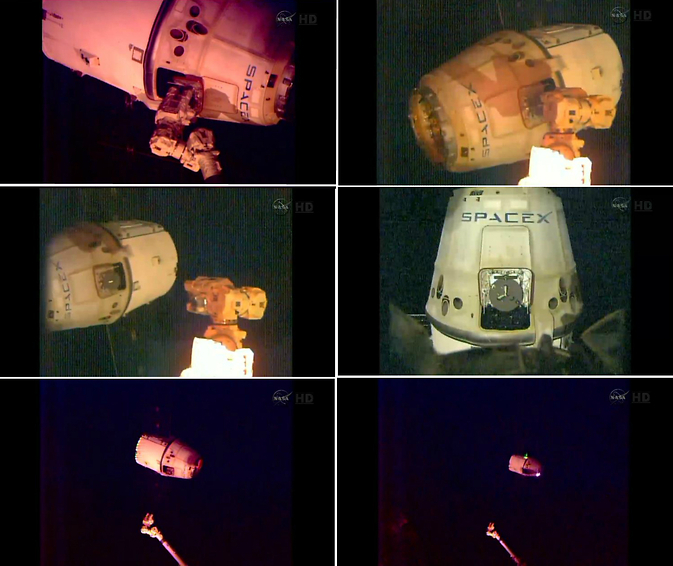 Virts also installed a centerline berthing camera to support the mating of Dragon to the Harmony node. Dragon is due for launch on its fifth Commercial Resupply Services mission Friday at 1:20 p.m. EST and with its capture scheduled at 6 a.m. Sunday. The three astronauts also worked on a variety of science studying combustion and botany and even learning how to operate basketball-sized satellites that float inside the International Space Station. The three cosmonauts in the station’s Russian segment also worked on their task list of science and maintenance. Italian astronaut Samantha Cristoforetti is seen inside the Unity node of the International Space Station. Commander Barry Wilmore and Italian astronaut Samantha Cristoforetti brushed up Friday afternoon on robotics skills necessary to capture an approaching spacecraft with the Canadarm2. The duo will be inside the Cupola carefully monitoring the SpaceX Dragon as it approaches the International Space Station next week. Wilmore will be at the Canadarm2 controls to capture Dragon. Cristoforetti will be his backup. Earlier, Wilmore scrubbed the cooling loops on a U.S. spacesuit after replacing its fan pump separator the day before. NASA astronaut Terry Virts sampled and tested the water conductivity inside the spacesuit. Virts, Cristoforetti and Wilmore also started their day with medical science including a periodic fitness test and Ultrasound scans of the arteries. On the Russian side of the space station, cosmonauts Alexander Samokutyaev and Elena Serova worked on an experiment that studies micrometeoroid detection techniques. Flight Engineer Anton Shkaplerov had an Earth photography session observing the effects of natural and man-made disasters. The trio also spent the day on routine maintenance throughout the Russian segment. Astronaut Terry Virts works inside the Combustion Integrated Rack in this photograph taken Nov. 28. Commander Barry Wilmore completed spacesuit maintenance work Thursday and began testing the spacesuit to return it to service. Italian astronaut Samantha Cristoforetti cleaned up and stowed the spacesuit hardware and tools. The next U.S. spacewalk is targeted for early 2015. After the spacesuit work Wilmore joined Flight Engineers Samantha Cristoforetti and Terry Virts to review activities planned for next week’s SpaceX Dragon launch scheduled for Dec. 16. Virts and Cristoforetti earlier started their day on medical science and a periodical fitness check. Virts went on to open the Combustion Integrated Rack for fuel gear replacement work. Veteran station residents and cosmonauts Anton Shkaplerov and Alexander Samokutyaev were back at work inside the Zarya cargo module installing overlay sheets on interior panels and disinfecting them. Russia’s first female cosmonaut Elena Serova worked science studying radiation in the station and the Sun’s influence on Earth’s magnetic field. Samokutyaev also joined Serova for observation of the cardiovascular system while working out on an exercise bike. Shkaplerov worked throughout the day studying chemical reactions in Earth’s upper atmosphere. 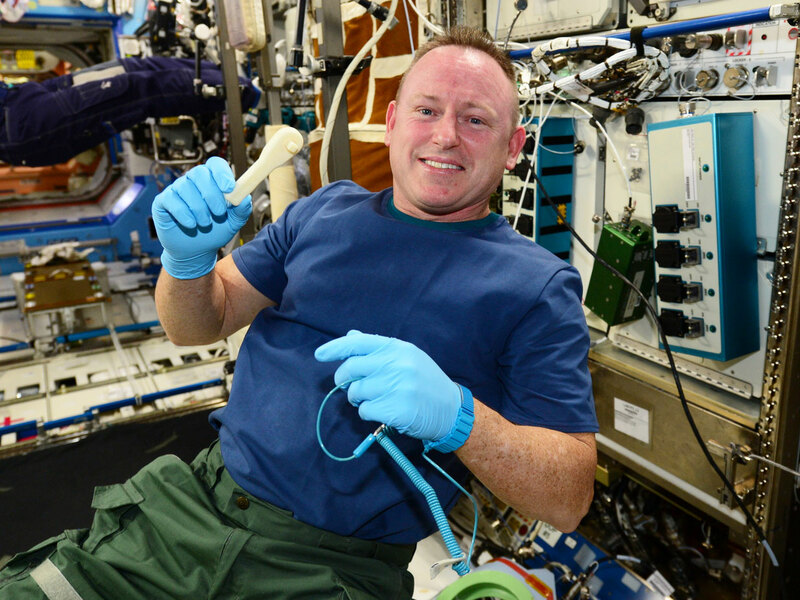 NASA astronaut and Expedition 42 Flight Engineer Terry Virts worked on medical science Wednesday morning and later set up commercial research gear for an experiment to be delivered on the next SpaceX mission. Meanwhile, station Commander Barry Wilmore and Italian astronaut Samantha Cristoforetti continued this week’s maintenance work on a U.S. spacesuit. During the morning Wilmore and Cristoforetti joined Virts for eye scans using the station’s Ultrasound equipment. At the end of the day, Samantha put on an armband sensor that monitors a body’s core temperature for a study that observes how a crew member adapts to a 24 hour cycle in space. Cosmonauts Alexander Samokutyaev and Elena Serova were back at work installing gear and connecting cables for a micrometeoroid detection experiment. Veteran station resident Anton Shkaplerov started his day installing software updates on Russian laptop computers then spent the afternoon auditing the laptops. Meantime, SpaceX is counting down to the launch of its Dragon commercial cargo craft Dec. 16 at 1:31 p.m. EST. NASA TV will provide live coverage of science, technology and pre-launch briefings including the launch itself. Italian astronaut Samantha Cristoforetti and Commander Barry Wilmore began fan pump separator replacement work Tuesday on a U.S. spacesuit. Cristoforetti started her day with medical science collecting saliva and urine samples for stowage in a science freezer. NASA astronaut Terry Virts worked on a variety of science including updating Ultrasound scanner software, checking a botany experiment and participating in an eye exam. Veteran cosmonauts Alexander Samokutyaev and Anton Shkaplerov started their day in the Zarya cargo module installing overlay sheet on interior panels. Russia’s first female cosmonaut to join a station crew, Elena Serova, conducted a photographic inspection on windows in the station’s Russian segment. The cosmonaut trio also worked on their task list of Russian experiments studying such things as chemical reactions in Earth’s atmosphere, detecting micrometeoroid impacts and a crew member’s sensory adaptation to long-term microgravity. 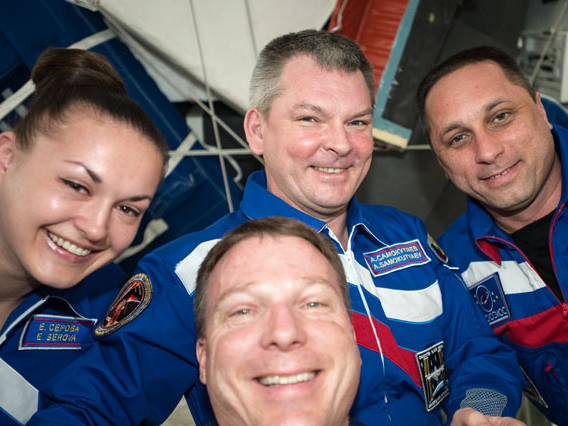 NASA astronaut Terry Virts (foreground) poses with his fellow Expedition 42 crew members behind him — (from left) Elena Serova, Alexander Samokutyaev and Anton Shkaplerov. Italian astronaut Samantha Cristoforetti joined Commander Barry Wilmore on Monday reviewing procedures to replace a fan pump separator on a U.S. spacesuit. Earlier, Wilmore partnered up with NASA astronaut Terry Virts for the Body Measures experiment that studies changes to a crew member’s body shape while living in microgravity. Cosmonauts Anton Shkaplerov and Elena Serova got together for a chemistry education experiment during the morning. Later, Serova joined Flight Engineer Alexander Samokutyaev for Russian maintenance work. The International Space Station is getting ready for the SpaceX-5 mission scheduled for liftoff Dec. 16. The Dragon commercial cargo craft will take a two day trip to the station before it is captured by the Canadarm2 and berthed to the Harmony node. Virts worked during the afternoon to activate a communications unit that will send commands to Dragon as it closes in on the space station next week.